If you are trying to give up red meat , pork and veal, you should try making this. I started this a long time ago by switching to ground turkey. I get my turkey freshly ground by my local butcher, it is antibiotic free and free range. But, you can use any ground turkey you like. This recipe tastes best with ground lean dark meat, but you can substitute white meat which tends to be a bit dryer. The thing with using the turkey is that it needs a lot of spicing up, sweetening and simmering for great flavor. After years of experimenting , I find this combination to be excellent. The better the quality balsamic the better it tastes. Lots of fresh garlic along with the tomatoes , italian spices and basil makes it very flavorful, and then finish it off with more parsley and fresh chopped basil and some freshly grated parmasan reggiano and a bit of pecorino romano. white or baby bella mushrooms, or a combo of both, can add whatever mushrooms you like. Chopped fresh parsley -1-2 tablespoons. Add towards the end of cooking time. Add olive oil to deep skillet. Add to this the onions, carrots, celery and and stir in the italian seasoning. Add the garlic and the tomato paste, cook 2 minutes. Add the turkey and cook till brown…Add mushrooms and tomatoes with juice. Add balsamic and wine, salt and pepper. Cover and cook at low for 20 minutes to 1/2 hour. 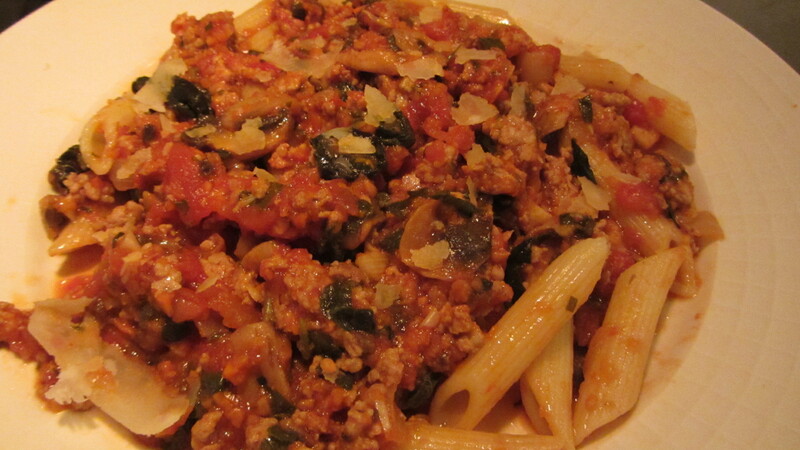 Stir in fresh basil and serve with pasta and parmesan reggiano….